shares the Unity cup and the candles are extinguished. 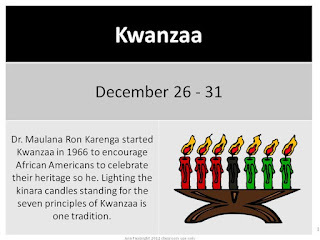 principle of Kwanzaa – Ujima (oo-JEE-mah): Collective work and responsibility. red, the farthest right green. And then the next red candle on the left. This represents the 4th principle of Kwanzaa – Ujamaa (oo-jah-MAH):Collective economics. the farthest right green, the next red and then the next green candle. 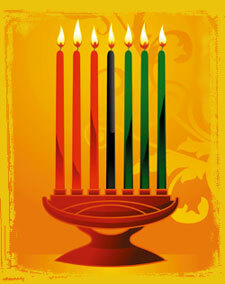 This represents the 5th principle of Kwanzaa – Nia (NEE-ah): Purpose. final red candle. This represents the 6th principle of Kwanzaa – Kuumba (koo-OOM-bah): Creativity. Kuumba (creativity). So be creative!! shared. After everyone has taken a drink the candles are extinguished. farewell statement to the feast and the year. to liberation and a higher level of life. Then the elder leads the guests in the Harambee (ha-RAM-bee) salute. torso, saying “Harambee!” This is done seven times in unison. 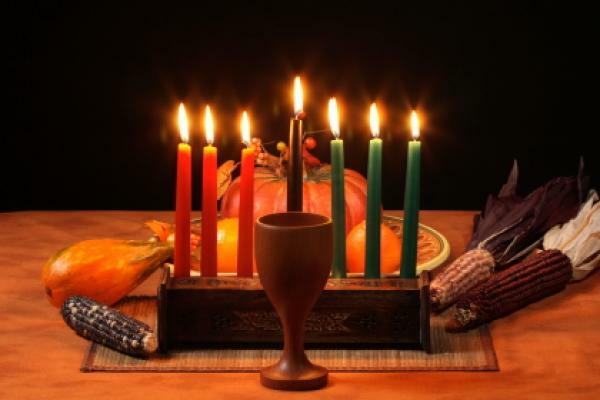 principle of Kwanzaa – Imani (ee-MAH-nee): Faith. You and your family can use great creativity in your observance of the holiday. Set up an area in your home for the Kwanzaa altar or table. Decorate your home in the same spirit as other holidays. Create posters and banners to hang on the walls, add African sculptures or other artwork. Crafts and decorations can be created to be used in your Kwanzaa display.